This program applies to MAZDA3 Sedan, MAZDA3 Sport, MAZDA5, MAZDA6, CX-3, CX-5, CX-9, MX-5 and Certified Pre-Owned vehicles. New 2016 MAZDA3 Sedan, MAZDA3 Sport, and CX-3 customers also benefit from the program by receiving an additional $500 discount on their purchase. This program can also be used in combination with all other incentive programs, including the Mazda Graduate Rebate. 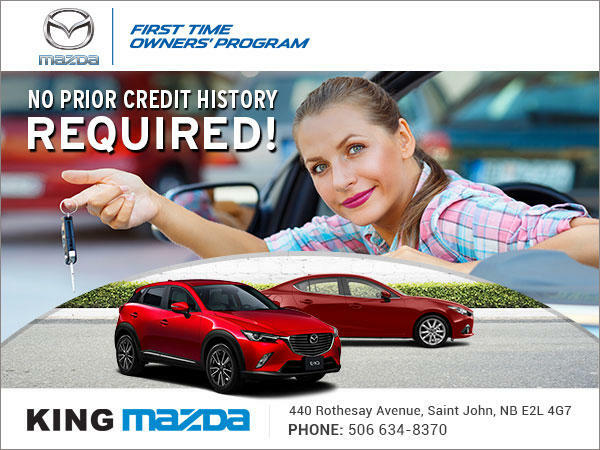 Contact King Mazda for more information. Send me exclusive offers and promotions. View DisclaimerBy submitting your email address or phone number, you allow us, King Mazda, to include you on our contact lists to send you information about our products, services and promotions. You may revoke consent at any time by clicking on the "Unsubscribe" link in your email.